Camera modules for coax & non-coax video systemsIt can be used with coax video systems ..
Videx 4000 series colour camera modules with built-in speaker in stainless steel and aluminiumBo..
4000 Series Speak Unit Front Panel ModulesThe audio speaker unit module is the basic part to bui..
4000 series blanking module - stainless steel for modular door panels. Also available in aluminium f..
4000 series rear lit information module for modular door panels.Suitable for House name or operating..
To meet equality/DDA requirements, this module adds an induction loop to a 4000 Series panel so that.. The front support is available in 1, 2 and 3 module versions and includes:- The flush back box ..
Infra red remote control for 500MM apartment station. Used with the 500MM apartment station this all.. Available in stainless steel(/S) or aluminium(/A) this module can be used for mounting non-Videx equ.. 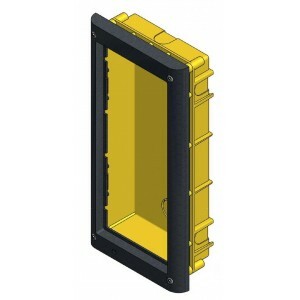 Surface back box for the VK8K video kits [Dimensions: 140mm(W), 203mm(H), 62mm(D)] ..